SeanSweeneyAuthor.com is proud to announce the publishing of the author’s 25th novel! 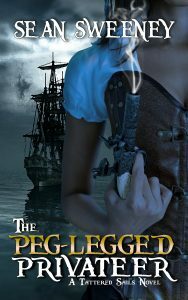 The Peg-Legged Privateer: A Tattered Sails Novel, part of David “Debord” Wood and J. Kent Holloway’s Tattered Sails shared fantasy world, has been released in paperback and digital form and is available now at all major online retailers. Tattered Sails is a fantasy world set in the Golden Age of Piracy, alongside of our own world. Paulina is the titular Peg-Legged Privateer under the service of the 12th Baron Wilton, William Weaver, the governor of Spicer’s Bay. And as our tale begins, Paulina is in a spot of bother: she has just lost her third ship to the Caribe and its mythical denizens, and she is half-swimming into the Bay with treasure in one hand. Paulina is a strong female character, a wiley one who is brash at times–and also rather duplicitous. To see for yourself, pick up your copy today!